A while ago I posted a video and proclaimed my new found love for US Presidential Candidate Ron Paul. Today I love him even more and hope to watch him make political history. A group of Ron Paul supporters have organized a fundraising drive called "Tea Party 07" to commemorate the Boston Tea Party on December 16th, 1773. Their goal is to raise 10 million dollars for Ron Paul in one day. It's amazing to watch this grass-roots revolution. 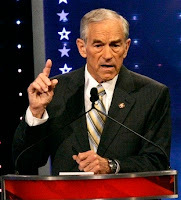 Click here to watch history and find out why Ron Paul is the phenomenon of the 2008 US election. He has more YouTube subscribers and video views than Barack Obama, more donations from war veterans than any other candidate and more donations in a single day than any other candidate. He is the only Republican that has consistently opposed the Iraq war from the beginning, he voluntarily opted out of a government pension and would completely eliminate income tax. If you're in the US I'd highly recommend voting for him.